We believe that the possibility for a joyful living is never exhausted. Ecological agriculture can show the simple path to enjoy our lives. In bangla the word for joy is ‘ananda’: it is a beautiful and nuanced word and carries distinctly very deep and spiritual meaning in local vernacular over and above its Sanskrit origin. The word 'ananda' highlights the ecstasy of living in harmony with the 'present' ('বর্তমান'). Major saints of Bengals were critical of both so-called 'spiritual' or 'materialist' understanding of the world, a binary they tried to critically avoid. Their claim, that draws us near to them, that there is nothing beyond wahat we experience here as a living material being. They reject all forms of presuppositions and truth claims. The 'world' to them is always 'present', both as a unity as well as in its diversity and difference, as both spirit and matter or as subject and object. In popular terms, usually understood by the famers intuitively, the world is both One and Many. The most profound knowledge we cherish is the relations and connections we make to the 'other'; to transform us into 'One'. Nayakrishi Andolon as a farming practice belong to the global movement of organic and ecological agricultural. However two salient feature make the movement distinct: (a) Nayakrishi's grounding in the grand tradition of Bengal's spiritual movement, particularly what is known as Nadiya school; (b) secondly, the staretegic focus on seed and genetic resources as the organising principle of life-affirming agriculture and (c) the seed and the genetic resources as the major site of political, economic and ideological battle that has been redefining agrarian questions in the present era of corporate bio-piracy and the intellectual property rights. Strategic focus on seed and genetic resources is therefore a critical cultural issue as well. The word 'beez' stands for the seed and genetic resources in Bangla and extremely rich in linguistic nuances, semiotic implications and creative popular imaginations. People's daily discourse retains the resourceful meaning of 'Beez' and reinforces the suggestion that conservation and regeneration of seed, i.e., life is an issue of natural survival. The word 'anada', the joyul living, or in other words to live in harmony with others, is based on simple realization that human beings are never independent entities or soul, never lonely in the vaste and overwhelming universe. We are always in One or are One. We cohabit with all where both animate and inanimate entitities remain 'present' both in our thinking as well as in a state that we call real world. We have learnt over years that the most sensuous and superbly spiritual way to relate with the Nature is agriculture. Nature we find existing outsaide us as an eternal gift. The joy in planting seed and harvesting and sharing food with all life forms is the foundation of the most joyous community we could imagine and our activities are consistent with our imaginations and dreams. We love agriculture; it is the way of our life. We invite you to be the part of our world. Plant the seed of joy and cultivate 'ananda' with us. Nayakrishi Andolon literally means New Agricultural Movement. 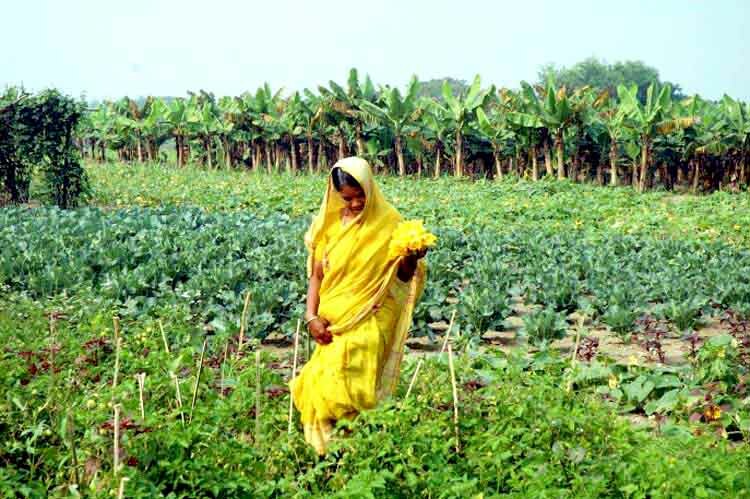 Initiated by community-based works of UBINIG, It is now led by farming communities of Bangladesh practicing biodiversity-based ecological agriculture. As farming practice, Nayakrishi follows ten simple rules to ensure food and seed sovereignty. Strategic focus of Nayakrishi is to conceptualise farming houselods as active ecological units and enhance the role it plays in in situ and ex situ conservation of biodiversity and genetic resources. Nayakrishi belives that agriculture is a way of life and the foundation of a civilisation that must be critically revalued so that we dont replace or destroy the foundational basis of life without which all life forms, including human species, can not survive. Nayakrishi is activities that unfold the potentialities and power inherent in the ecosystemic unity of human communities and nature. In bangla the literal meaning of the word 'krishi'( কৃষি ) is agriculture, meaning the act of cultivation but not in the conventional sense as we understand food production now, which is industrial production of consumer goods for the human beings. Like factory, earth or nature in this case in conceptualise as merely the means of production. The word ‘krishti’ (কৃষ্টি) is derived from the same root of krishi implying culture or civilisation. The word 'krishi', though etymologically from Sanskrit, stands for the wider bangla notion called 'chashabad' (চাষাবাদ)that means engaging in a metabolic interaction with nature. It implies that cultivation is an active relation between human beings and nature that transforms both. Agriculture is indeed a profoundly cultural practice that determines how we decide to define our fundamental relation to the nature, i.e., the world we experience as external to us. Although such experience is illusory since we indeed are merely nature’s part; we ourselves are nature. As a natural being therefore, Nayakrishi is about defining our role as an agent of transformation as nature intends us to play. This foundational relation determines how we build communities, villages, cities and nations and how we should relate and interact with each other in the community. In this broader context Nayakrishi has far reaching cultural and civilisational consequences. In this metabolic interaction unity and integrity prevails between human beings and nature. In this reciprocal relation we do not experience and conceive us as the supreme agent possessing, commanding and controlling nature; the nature transforms the human beings as well and speaks through the farmer. A communication is set into motion and farmers develop the ability to listen to the needs of soils, organisms, plants, animals, water cycles, etc. In return nature responds with the harvest. It is an act of reciprocal nurturing. There is no outside and inside in this reciprocal existence. In Krishi nature thinks through the farmer and the farmer here means the thinking being that interacts and responds to nature through his acts that nurtures the both. What one finds outside is also what could be found in the human body is an old precept in Bengal. In a way implying how you treat the outside should it be the same if you were treating yourself. Nayakrishi, since its inception, explored popular wisdom, imagination and historical practices in order to unfold the potentialities of knowledge base of the community. both human beings and nature as a single organism. (New Agricultural Movement) is by now a major ecological movement in Bangladesh involving over 300,000 farming families. The strategic focus of agriculture at present is biodiversity and genetic resources. The Nayakrishi distinguishes its practice from commonly familiar ‘organic’ agriculture for various reasons. Emphasis is on the biodiversity based life activities, developing an operational notion of ‘ecosystem’, ensuring various natural cycles of water, elements, nutrition, energy, evolution and demonstrating the validity and authenticity of experiential knowledge. These are some key features that distinguish Nayakrishi practice from commonly known ‘organic’ agriculture. Nayakrishi Andolon is not simply about production of ‘food’ but regeneration of communities with conservation and enhancement of their wealth for healthy, happy and enriched life. Nayakrishi bases itself on the experiential processes of learning and judges all knowledge-claims and statements on the basis of its own practice, but remaining conscious of its own limits. Nayakrishi Andolon, therefore, is an open learning process. It learns from anybody, everywhere and from anywhere. Nayakrishi over the years learnt intensively and extensively from various renowned approaches. It learnt from Permaculture, Bio-dynamics, Fukuyaka, ancient Indian practices of forestry, Ayurveda and home gardens and of various Sufi, Bhakti and Jain-Buddhist systems of practising self-conscious lifestyles to allow the cosmic or unitary energy of nature to express in a particular place and time. Andolon is movement -- movement at various levels: cultural, mobilisational, political and organisational, etc.. It is also a movement at the site of ideology, discourse and power. Nayakrishi is the practice to critically revalue agriculture and agro-ecology against the paradigm of industrial food production and industrial development. We must interrogate the dominant discourses related to food, nutrition and agriculture and stand against the the global processes that replace and eliminate farming communities in order to install transnational companies to take over the food production and control the global food chain. At the margins of imagination Nayakrishi evokes the spiritual meaning of 'paradise', the promise of a future where we will be rewarded with the eternal blissful life in harmony with nature if we act properly and responsibly at the present. The promise animates our ethico-moral determination . Therefore Nayakrishi Andolon is the movement to change our present destructive lifestyles; we need a lifestyle movement that is proper for human beings endowed with the capacity to act politically and spiritually against the destruction of conditions of life and livelihood. Nayakrishi therefore is a movement to move from destructive and predatory stage of civilization to creative and joyful interconnectedness. In short, Nayakrishi is an idea and practice of life-affirming activities. The very practice carries the seeds to change our existing lifestyles of hierarchical, coercive and exploitative relations with others and predatory habits and propensities that harm us collectively. The Nayakrishi practice is based on a very simple guiding tip: observe, learn, taste and experience the processes of life as nature and transform in order to unleash the Ananda -- the joy of living. The nature, in Nayakrishi, includes the observer and the observed, the agent and the field of actions, the result and the process, etc. Nature has no meaning without joyous beings capable of thinking, imagining and acting in nature, their home. A typical Nayakrishi village, where diversity is ensured through mixed cropping, crop rotation and various multiple ways of using the 'space' by desinging allocation of 'places' for various species and varieties. While 'place' is fixed and finite, the 'space' is not. Nayakrishi is about diversity. Diversity of species and varieties, diversity of ecosystems and habitats, diversity of knowledge and knowledge practice and diversity of relations that maintains the dynamics of all entities as part of the whole. The biodiversity and genetic resources is a major area of work of Nayakrishi. However, ability to appreciate the bounty and the diversity of beings is dependent on the cultivation of the faculties of the observer. Diversity is not merely the property of the observed. There could be no diversity unless we consciously develop our faculties to distinguish diverse elements in their difference as well as in their unity, connections and relations. Although most of us as naturalists, conservationists or passionate ecologists would like to conserve and use biodiversity as if they are only phenomenon of the outside world such as in the forest or the landscapes, Nayakrishi does the opposite. It cultivates the faculties to experience, hear, touch, smell, taste and enjoy the multiple manifestations of life. Farming practice of Nayakrishi Andolon follows various operational rules. These Rules are summarised in 10 statements adopted by the farmers themselves, mirroring 10 fingers of their hands. They are developed through day to day experience and knowledge. Absolutely no use of pesticides & chemical killers. Transform so called 'pest' into biological resources. Nayakrishi farmers do not use any form of pesticide or poison, organic or inorganic. herbicides or any chemicals that kills or harms life. Pesticides do not only kill pests, it kills all life forms including those that are necessary for the fertility of land. Monoculture and unreliable seeds are the two main reasons for pest attacks. Pest control practices are done in Nayakrishi Andolon by two primary means: (1) through mixed cropping practices, by the production of biodiversity; and (2) developing high quality local and indigenous seeds that have been adopted by the farmers through prolonged use. An introduction of any new variety is very closely monitored and researched by experienced farmers before they are integrated into Nayakrishi system and distributed for wider cultivation in the Nayakrishi areas. Nayakrishi farming practice discourages the use of artificial and/or chemical fertilisers. A healthy piece of land, that ensures good soil nutrition and activities of living micro-organisms, earth worms, insects and other life forms -- do not need any external input, even composts. Therefore, in Nayakrishi the primary focus is always the soil management and not external supply of fertilisers. Chemical fertilisers are not used because they pollute the environment. They are allowed only in case of very degraded soil mixed with compost. Organic fertilisers, as external inputs, are not encouraged either because that undermines the art of soil management through the very method of cultivation. Farmers are encouraged to collect compost materials from within their farm. The use of nitrogen fixing legumes is strongly encouraged and promoted. Since Nayakrishi is premised on biodiversity, the guiding notion is selection of right crop or plant for specific ecosystem. The concept of “fertile land”, is an economic term and presupposes that lands can be classified as fertile and non fertile without any reference to its suitability for specific kind of plants. The question is rather what kind of crop is suitable for what type of land. However, for transition from checal based conventional farming to Nayakrishi practice, a gradual decrease of chemical fertilisers are accepted, particularly, in cases where the land has been severely degraded because of a heavy dose of chemicals in the past. Seed is the most important strategic site for the success of Nayakrishi movement. The traditioal practice of seed conservation by farmers are improved and conserved in Seed Huts and Community Seed Wealth Centers. Seeds and genetic resources are the common resources of the community and must be conserved at the household and community level. Growing food by farmers is integral to keeping seeds for generations. Farmers regenerate and expand their biodiversity and genetic base. Control over seed is the lifeline of the farming community and ensures the command of the farmers over the agrarian production cycle. Strengthening farmer's seed system is essential for innovation and knowledge generation. Given the world history, specifically examples of biopiracy in the unequal world dominated by the transnational companies, Nayakrishi Andolon believes that defending seeds and genetic resources has become the key political issue of our time. The rule that seeds and genetic resources should never get out of the hands of the farmers, particularly women, is strictly practised. The rule also implies resisting privatisation of seed, genetic resources and patenting of life forms. Within the emerging global regimes of intellectual property rights, as inscribed in TRIPS (Trade Related Aspects of Intellectual Property Rights), it is imperative that farming communities can defend their biological resources from piracy. On the other hand, conservation of seed and genetic resources is the only guarantee that farmers, particularly women, can ensure their command over the agrarian production cycles. Most importantly, and it must be realised by the world community as well, that the future food security and the availability of germplasm for all, are directly related to the functioning of the biodiversity-based production systems. This is the predominant feature of Bangladesh agriculture, where the articulation of in-situ and ex-situ conservation of seed and genetic resources is highly advanced and based on the ingenuity of an experience that took hundreds of years to evolve. It is not simply to the interest of the Bangladeshi farmers; it is mainly for the interest of the world community that such production systems are not endangered. Stop the use of deep tube wells and extraction of groundwater. Nayakrishi farming does not need the use of deep tube wells and works with the farmers to evolve innovative irrigation systems using surface water. The agricultural practices that are heavily dependent on ground water extraction must be radically transformed. Arsenic poisoning and serious crisis of drinking water is already disastrous. Nayakrishi farmers have been able to stop deep tubewell in the villages; and thereby save the farmers from unnecessary expenditures on diesel or electricity and reduces the dependence on deep tubewell owners. The arsenic in the drinking water and the disastrous consequence of extracting groundwater for irrigation for the cultivation of the so-called “high-yielding varieties” is by now, well known internationally. Nayakrishi Andolon from its very inception was raising concerns about the deep tube wells for irrigation with subsidised electricity, availability of low interest credit and other governmental support for newly emerged 'water lords' in the village. Despite the fact that a very large number of populations in the different districts of Bangladesh are severely affected by arsenic poisoning there is no attempt to change agricultural practices. Nayakrishi Andolon, campaigns against the use of deep tube wells and works with the farmers to evolve innovative irrigation systems using surface water. There is no problem of availability of water in Bangladesh; rather, it is mainly the problem of water management. The agricultural practices that are heavily dependent on ground water extraction must be radically transformed. Produce both cultivated and uncultivated food and manage spaces for the both. Nayakrishi is not only about cultivated crops. The uncultivated plants, fish and animals constitute an important place in the local agricultural system and are consequently a vital part of agricultural practice. The very act of collecting uncultivated biodiversity and using to prepare food or feed livestock brings farmers, particularly women and young children, into a distinct relationship with cultivated and uncultivated spaces. Management of uncultivated spaces for food sources are vital to address the food need of the extremely poor and marginal population. Multi-cropping or mixed cropping, inter-cropping, crop rotation, agro-forestry and other familiar methods are used in Nayakrishi mirroring the diversity of the forest. Such practice retains and enhances soil fertility and productivity. The practice of multi-cropping or mixed cropping is an excellent risk management strategy internalised into the production practice. Ecological designing is the careful selection of local species and varieties depending on the nature and characteristic of a farming household and knowledge skill of the household members to ensure support for the highest number of life forms and maximum systemic yield to meet household need as well as need mediated by the market. Increasingly farmers are convinced that the best method for pest management is conservation and constant regeneration of biodiversity. The practice of “misra fashal” or multi-cropping has become popular for pest management and, crop rotation to maintain the health of the soil. Farmers know that using fertilisers (organic or inorganic) as external input from outside the farm is not the ideal way to remedy the fertility crisis of the soil. The designing of the mixed cropping and the crop rotation is more effective including integration of nitrogen fixing species of plants and trees. Farmers are eager to experiment with newer species or varieties in connection with soil health and yield. They are aware that “external” application of inputs is a hangover from old habits of chemical agriculture. Farmers are constantly innovating new ways to increase the fertility of their soil, without “external” inputs. The ingenuity lies in recognising the fact that soil becomes alive if proper care is taken. These practices have the immediate benefit of higher productivity in terms of the total yield of the farming household. This is also the reason why Nayakrishi farming practices are economically gainful for the farmers, compared to mono-cultural practices, ensuring household food security and at the same time crops for the market. Nayakrishi calculates total yield of a farming household coming from food, fuel-wood, fibres, and construction materials, medicine and other sources. Over and above gains of the individual households, material gains of the whole community is also qualitatively and quantitatively identified. Villages are mapped as constituting distinctive eco-systems that includes the local and indigenous knowledge of the community. The yield potential of a system or a cluster of systems is also assessed in order to develop highly productive biodiversity-based ecological production systems. A household is seen as a nodal point in forming a mosaic in a complex system. These ideas and practices are promoted in local level planning, particularly in those villages and unions that are already advanced as Nayakrsihi villages or unions. It is becoming increasingly apparent that Nayakrishi is the future of agriculture that can ensure increased yield and enough surpluses to meet the need of Bangladesh as well as other countries. Given the fertile land, plenty of fresh sweet water, ingenuity of the farming communities and the advanced biodiversity-based farming practices, Bangladesh could feed the whole Europe with safe and nutritious food. The material, social, cultural and spiritual gains of the community as a whole through the maintenance and enhancement of biodiversity is a crucial factor in addressing poverty and vulnerability. Nayakrishi farmers are capable to calculate the total yield of the farm, not the quantitative productivity of a single crop. The falsity and the lack of scientific basis of the paradigm of productivity calculation of the “green revolution” are clear to the farmers. The perception of ‘real’ productivity and capacity to audit the production and enhancement of natural resources in addition to yield of the harvest of the total system, is crucial for national policy as well. Nayakrishi Andolon is creating the basis for that alternative paradigm. Livestock, poultry and semi-domesticated birds are integral part of the farming household. Nayakrishi farming practices ensure food and fodder for all domesticated animals and birds. The production of local variety of crops provides fodder for livestock. On the other hand, the cows, bullock etc. are needed for the production of crops. Livestock and poultry production is integrally related to the diversity of crops. Nayakrishi is critical of fragmentation and departmentalisation of agriculture into crop, livestock, poultry, fisheries, forestry, etc. Local breeds of livestock, poultry and fish are specially desired, cared, supported and preferred. Local breeds are almost always economically advantageous and ecologically suitable and add to the cultural world of the farming communities. Nayakrishi farmers are critical of artificial insemination for moral and cultural reasons but they are not against natural cross breeding. The artificial insemination is a disgrace to animals, and an insult to the female principles of ‘Nature’. Farming women of Nayakrishi are strongly against artificial insemination or any artificial experiment on animals or birds. 'Once it is tried on animal, sooner or later the male-science will try that on women' -- is their apprehension. Nayakrishi farmers also reject the concept of “pure” breed. This concept assumes that life processes can and should be separated from evolutionary processes for the egocentric desire for a particular trait. Purity of breed also related to the notorius history of eugenics. Nayakrishi adores contingencies and surprises of nature. Nature can not be reduced into mechanised machine to deliver anticipated results. Water is vital for flood-plain eco-systems as well as rain-fed agriculture. Water is the source of conserving biodiversity of plants and fish resources. Bangladesh is a variation of flood-plain eco systems. The ecology of the dry lands are also determined by the nets of river and the rain water. Aquatic biodiversity, including fish species, is an integral part of agricultural practice. A variety of fish can be maintained only if land and water is kept free of chemicals and poisons and agriculture is designed to support the habitat of different aquatic species and varieties. The fish biodiversity is directly related to the nature of agricultural practice. Aquatic biodiversity, including fish species, is an integral part of agricultural practice. A variety of fish can be maintained only if land and water is kept free of chemicals and poisons and agriculture is designed to support the habitat of different aquatic species and varieties. The fish biodiversity is directly related to the nature of agricultural practice. The fish are the part of the food system of Bangladesh. The conventional form of agriculture has severely destroyed fish and aquatic resources. It is a challenge for Nayakrishi to regain the fish and aquatic resources, by integrating aquatic biodiversity into Nayakrishi agricultural practices for maintenance and enhancement. Introduction of exotic varieties of fish and alien species for commercial purposes has caused serious destruction of the local varieties. The conservation of the indigenous varieties is a major activity of the farming community in their alliance with the fishing communities. The media image of Bangladesh as a flood-prone country experiencing constant disaster is an absolutely urban, westernised and detrimental view that is totally blind to the role of flood water in agriculture. Such a view has seriously hampered the agricultural practice of Bangladesh. The billion dollar flood action plans and projects are premised on this conception of water and are the main causes of disasters and miseries by their destructive impact on the flood plain eco-systems and associated agricultural practices. As a counter-strategy, Nayakrishi Andolon emphasises the creative use of water. Rural planning of homestead, landscape and topology takes advantage of water as resources, particularly the floodwater, as a vital element of agricultural practice. Agriculture is not only the source of food, but also provides fuel wood, fibres, construction materials and medicine. Nayakrishi does not reduce agriculture merely into a food-supplying 'factory' . Practice of agro-forestry and integration of fuel wood, fruit and various multipurpose trees and medicinal plants along with rice and vegetable fields is therefore very crucial for Nayakrishi. Along with food farming households are encouraged to plant energy, fibres, construction materials and medicine is ensured in the rural areas. reconceptualises the farming households an Exotic or imported agro-forestry species are generally rejected, instead, local species are collected. Farmers are involved in various forms of research to identify the appropriate local species that are required. Nayakrishi integrates potters, weavers, blacksmith, craft persons and all forms of livelihood activities in the rural area i order to prosper as a community. Preservation of seed and conservation of genetic resources is the lifeline of the farming communities and ensures the command of the farmers over the agrarian production cycle. The seed resource conservation is organized through a very innovative form of seed network organization, called the Beez Sangho or Nayakrishi Seed Network (NSN). The Nayakrishi Seed Network (NSN) builds on the farming household, the focal point for in-situ and ex-situ conservation. Farming household is the nodal interactive point for ex situ and in situ conservation. Farmers maintain diversity in the field, but at the same time conserve germplasm within the household to be replanted in the coming seasons. This is where women members of the households assert their role and power. This is also the basis upon which Nayakrishi Seed Network (NSN) has been built. The individual plans and decisions are made into collective decisions through meetings and collective sharing of information. In these meetings decisions are taken to ensure that in every planting season all the available varieties at the farmer's households are replanted and the seeds have been collected and conserved for the next season.The NSN functions in a systematic networking of seed preservation at the farmer’s household level to village pool of Seed Huts upto Community Seed wealth Centres. Community Seed Wealth (CSW) is the institutional set up in the village that articulates the relation between village and the National Genebank. The CSW also maintains a well-developed nursery. Farming households willing to take responsibility to ensure that all common species and varieties are replanted, regenerated and conserved by the farmers in a cluster of villages are formed as Nayakrishi Seed Huts (NSH).